A farm worker was electrocuted while using a pressure washer to clean hog pens. A short-circuit occurred in the receptacle end of the extension cord when the ground and the live terminals of the cord made contact. The short-circuit eliminated the path to the ground and, in turn, energized the pressure washer. Since the pressure washer was mounted on air-filled rubber tires, the farm worker who was holding the wash wand and touching the metal rail of the hog pen became a better path than the ground. Another worker suffered the same fate while working in a fish smoking plant. He was electrocuted when he touched a defective extension cord. 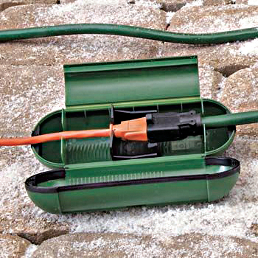 The extension cord, which had exposed conductors as a result of inadequate inspection and maintenance, laid on the wet salty floor and was plugged into a portable hand lamp to provide lighting in the work area. The worker, whose clothing was soaked with salt water, touched the exposed conductors and was electrocuted. Care must always be taken when working with electrical equipment. This becomes even more crucial when working in moist environments, since the equipment is more likely to be corroded and electrical currents more easily transmitted. Always do a visual inspection of all electrical equipment and never use equipment that shows wear and tear, fraying or overheating on any of the electrical components or wires. 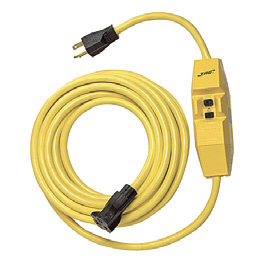 Electrical extension cords should not be used in place of permanent wiring. Permanent wiring must be in accordance with the Canadian Electrical Code, including toggle switches and outlets made for wet and damp areas. All electrical apparatuses used, such as extension cords and portable electric hand lamps, must be suitable for the intended environment as per the manufacturer’s designation. Never use an extension cord unless absolutely necessary and in a moist environment ensure that all extension cords have an integrated ground fault circuit interrupter (GFCI) or that the cords are plugged into GFCI receptacle outlets. Employees should wear ohm-resistant footwear or CSA-approved ohm-resistant rubber boots, as well as rubber gloves. Receptacles should be covered and protected from the moist environment. Inspections should be done regularly and a competent person should do a thorough yearly electrical inspection.